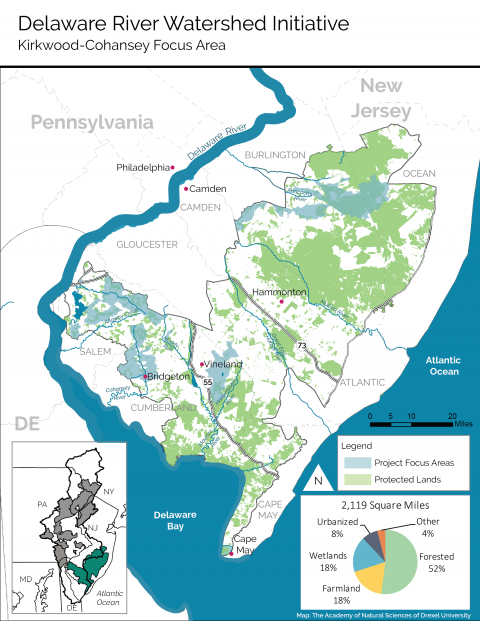 This cluster of watersheds is defined by a shared connection to the Kirkwood-Cohansey aquifer in New Jersey’s outer coastal plain, including much of southern New Jersey’s portion of the Delaware River watershed. The aquifer underlies nearly two million acres—about one-third of the state— encompassing two large landscapes that have been the focus of effective conservation efforts for decades. These landscapes are the Pinelands, a globally significant biosphere recognized by the United Nations and designated by both the federal and state governments for extraordinary protection, and the Delaware Bayshore region, which includes New Jersey’s largest concentration of farmland. Within the Pinelands are four major river systems. The largest is the Mullica River watershed— encompassing the Mullica, Wading, Batsto and Oswego Rivers—which empties into Great Bay and ultimately the Atlantic Ocean. 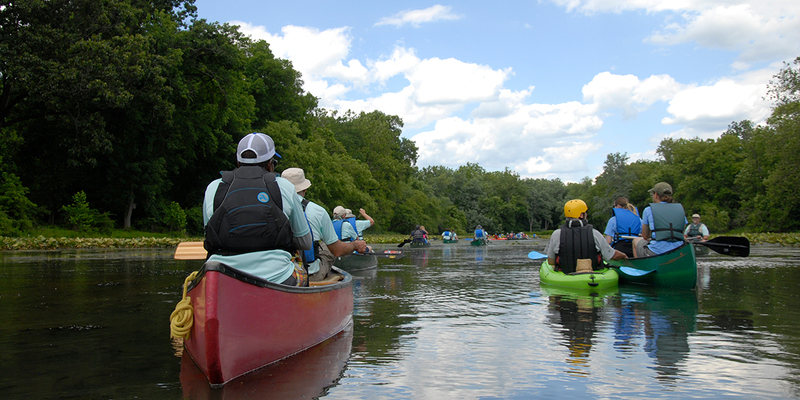 The second largest is the Rancocas Creek watershed, which drains west into the Delaware River. The Great Egg Harbor River watershed, including the Great Egg Harbor and Tuckahoe Rivers, drains into the Atlantic Ocean. In addition, several small rivers in the Bayshore portion of this cluster flow through extensive agricultural areas and deliver fresh water into the brackish lower Delaware River and the Delaware Bay, including the Salem, Maurice and Cohansey Rivers. Total Area 2,119 Sq. Mi. The interconnected ground and surface waters are highly vulnerable. Nutrients and sediment are washed from developed areas and farmland, and deficient septic and stormwater systems pollute the water. Forest fragmentation, poor land stewardship, and irresponsible off-road vehicle use also degrade water quality. Pumping of the aquifer lowers the water table, concentrating pollutants and reducing freshwater flows. The Kirkwood-Cohansey aquifer supplies virtually all the water in the streams, rivers, ponds and wetlands of southern New Jersey. It also provides more than 45 billion gallons of water each year to over a million residents, visitors, farms and other businesses. Farmers depend on ground water for irrigation, and the region’s cranberry industry uses vast amounts of aquifer water to maintain its bogs. The aquifer, however, is threatened by systematic over-pumping to serve human demands, and by pollution associated with urban/suburban development and agricultural use. In 2009, there were almost 3,000 wells (not including private domestic wells) withdrawing a total of more than 125 million gallons of water per day. This intense pumping lowers the water table, dries up wetlands, reduces stream flows and depletes freshwater flows to coastal estuaries. Most importantly, it depletes the aquifer itself. Along with impacts on human consumption, the depletion of the aquifer and its river systems cause changes in plant and wildlife populations, including the loss of rare species that live in affected surface waters and wetlands. Most streams fed by the Kirkwood-Cohansey aquifer (63 percent) are impaired by one or more contaminants, including fertilizers and pesticides. Urban/suburban development and farming also generate polluted stormwater and agricultural run-off and rob the aquifer of the filtering and recharge functions natural vegetation provides. Although much of the land in the Pinelands has some degree of regulatory protection through the Pinelands Plan, under the Pinelands Protection Act of 1979, these protections could be lost if the Pinelands rules are changed or revoked. As of 2007, about 743,000 acres of the aquifer’s area that is not preserved, developed or in wetlands was in private ownership, giving it high potential for development. In addition, although many acres of the Bayshore are permanently protected, most are not. In both parts of this cluster, unprotected land is subject only to local zoning and will likely be developed if not preserved. Partner groups are protecting intact forestland through acquisition, easements, and stewardship. Restoration of farmland will increase groundwater infiltration, reduce water use, build soil health, and buffer waterways. Rain gardens and bioswales will reduce runoff. Additional strategies—community engagement in advocacy, monitoring, and water efficiency; outreach to landowners and government officials; and protection of waterways from inappropriate uses—will advance conservation of water resources. 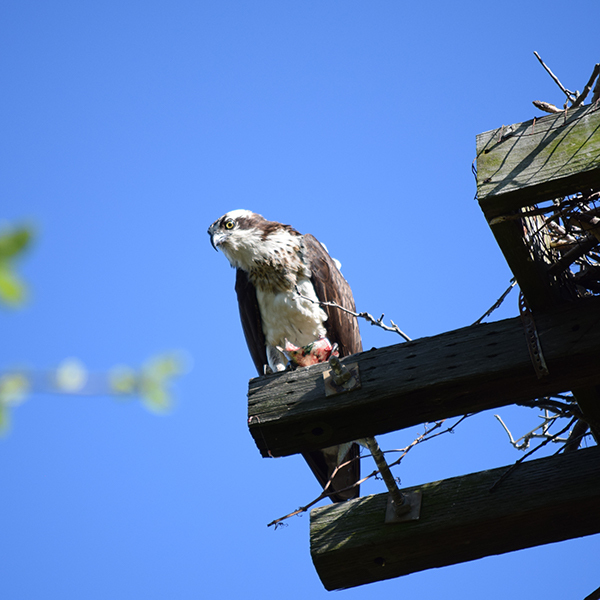 Accomplishments to date: Over the past four years, the partners initiated projects that will preserve nearly 5,000 acres and restored almost 2,500 acres. Partners also analyzed aquifer capacity and stream flow and worked with communities to implement water conservation practices. In addition, 44 sites were monitored for water quality. Projected outcomes: The partners anticipate protecting almost 3,000 acres of forestland. Agricultural conservation practices will be implemented on 2,800 acres. Green stormwater infrastructure and pollution prevention practices will treat nearly 70 developed acres. Water efficiency measures, paired with efforts to prevent increased groundwater withdrawals, will improve aquifer recharge. Together, the projects will protect nature, safeguard farmland, and restore lands damaged by aquifer depletion and poor management. Data collected for project-specific monitoring includes the number of acres preserved, damaged habitats restored, per capita waterusage in the focus areas, and individuals participating in outreach and engagement projects. In many cases, impacts on water table levels, water chemistry and biological communities will be difficult to measure directly. These assessments require advanced professional expertise because these projects relate to a large area and either the effects of any given action may take years to develop or it may not be possible to isolate the effects of the project from a “noisy” natural system. In some cases, however, the nature of a project lends itself to direct measurements. In such cases, it will be appropriate to monitor acidity, aquatic plant and fish communities, nitrogen and phosphorous levels, and aquifer withdrawals. Although complex, efforts to define and implement an effective monitoring plan for the aquifer can be a powerful organizing tool to galvanize improved protections in the Pinelands and the Bayshore for the groundwater that supports these unique landscapes. Partners anticipate leveraging $18 million from federal agencies, such as the USDA Natural Resources Conservation Service; state agencies, such as the Department of Environmental Protection’s Green Acres Program and the New Jersey Pinelands Commission; and donations from private foundations and individuals. American Littoral Society, Association of New Jersey Environmental Commissions, Natural Lands, New Jersey Audubon, New Jersey Conservation Foundation, Partnership for the Delaware Estuary, Pinelands Preservation Alliance, Rutgers University, South Jersey Land and Water Trust.